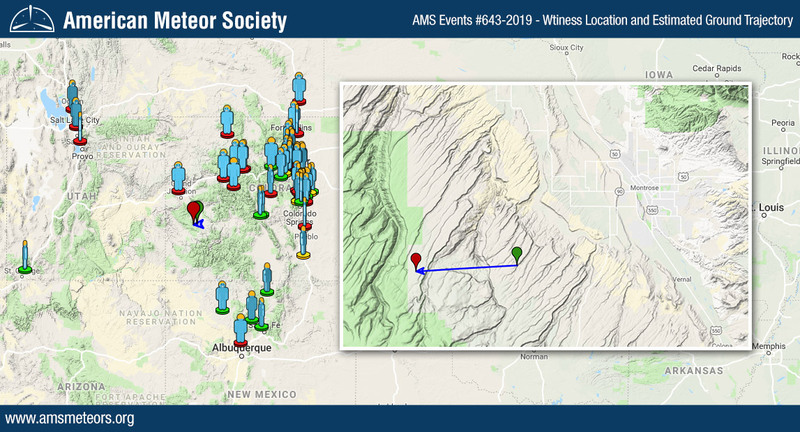 The AMS has received over 100 reports so far about of a bright fireball seen above Montrose, CO on Thursday February 7th, 2019 around 6:13pm MST (Feb 8, 2019 – 01:13 Universal Time). The event was mainly seen from Colorado but we also received reports from Utah, New Mexico and Wyoming. 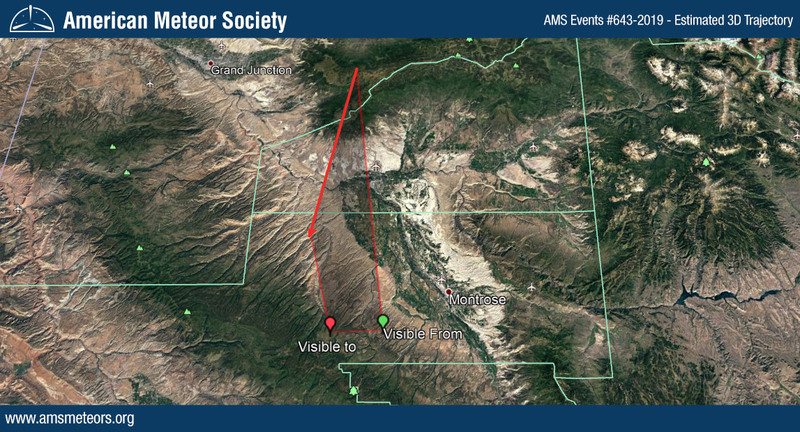 The preliminary 3D trajectory computed based on all the reports submitted to the AMS shows that the fireball was traveling from East to West and ended its flight South-West of Montrose, CO.
We also received multiple images of what looks like a smoke trail. Fireballs can develop two types of trails behind them: trains and smoke trails. A train is a glowing trail of ionized and excited air molecules left behind after the passage of the meteor. Most trains last only a few seconds, but on rare occasions a train may last up to several minutes. The second type of trail is called a smoke trail, and is more often seen in daylight fireballs than at night. Generally occurring below 80 km of altitude, smoke trails are a non-luminous trail of particulate stripped away during the ablation process. I saw it last night. I was driving west on hwy 94 about 5 miles east of Peterson AFB in Colorado Springs. It was travelling east to west and appeared to travel over Cheyenne Mountain. Searing white light moving extremely fast leaving smoke trail behind. Much brighter than Venus. 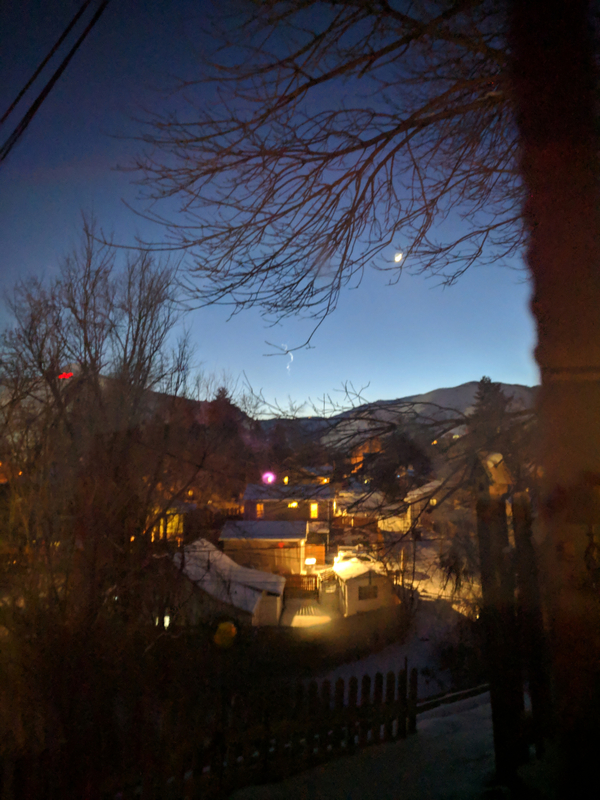 Other than the sun and moon, it was the brightest light I’ve ever seen in the sky. 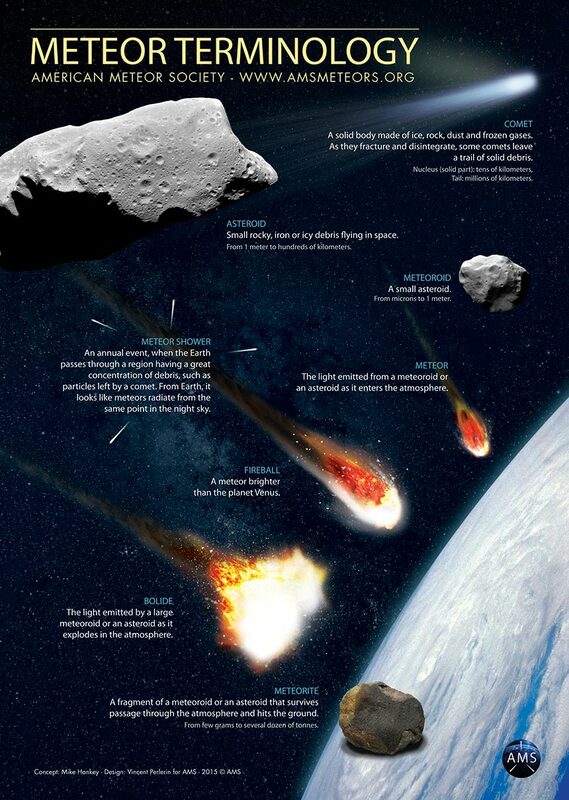 Never knew that that actual objects are meteoroids and asteroids. I always thought that meteors were the same as meteoroids. Now i know that meteors are the byproducts of a meteoroid. Meteorites are scary. They make it to earth. Science is interesting. I saw the smoke trail left by the fireball driving south on Hwy 73 from evergreen to conifer. I kept looking think what a weird jet stream. It was a very jagged zig zag smoke trail. We saw the fireball while driving on highway 160, on La Veta Pass. It was an extremely bright ball of fire zigzagging through the sky. It left a wiggaly smoke trail that lasted about 5 minutes. I have never seen anything like it before. I saw it as I was driving from Avon up to Beaver Creek. I saw it as I was driving north, just south of Española, NM. Very bright, smoke trail looked like it was only 50 miles away at best. I thought it landed between Chama, NM and the Jemez Mountains. Wow, that was over Montrose? I think this site is misleading when it claims that a fireball ended its flight in a specific location. Correct me if I’m wrong, but it seems they are not plotting Dark flight. I think it would be more beneficial if the map would include an estimated impact point on ground, otherwise people think a meteorite is on the ground at the red mark. You are correct, the plotted trajectory does not include the dark flight. The reason for that is that only a couple of events per year (out of several thousand) actually survive their plunge through the atmosphere to produce fragments on the ground. Therefore we feel it would be more misleading to imply that every fireball has dark flight and the potential to produce meteorites. Even if we did include dark flight our trajectories are only as good as the information we receive from eyewitnesses. We don’t even consider meteorites from any fireballs a possibility unless we receive many reports of sound from the event. Then we will use our computed trajectory as a rough guide to obtain a doppler radar image of the debris cloud. The area beneath this debris cloud is the true location of any possible meteorites. I hope this answers your question to your satisfaction.